This is the cutest Mother's Day craft for kids! 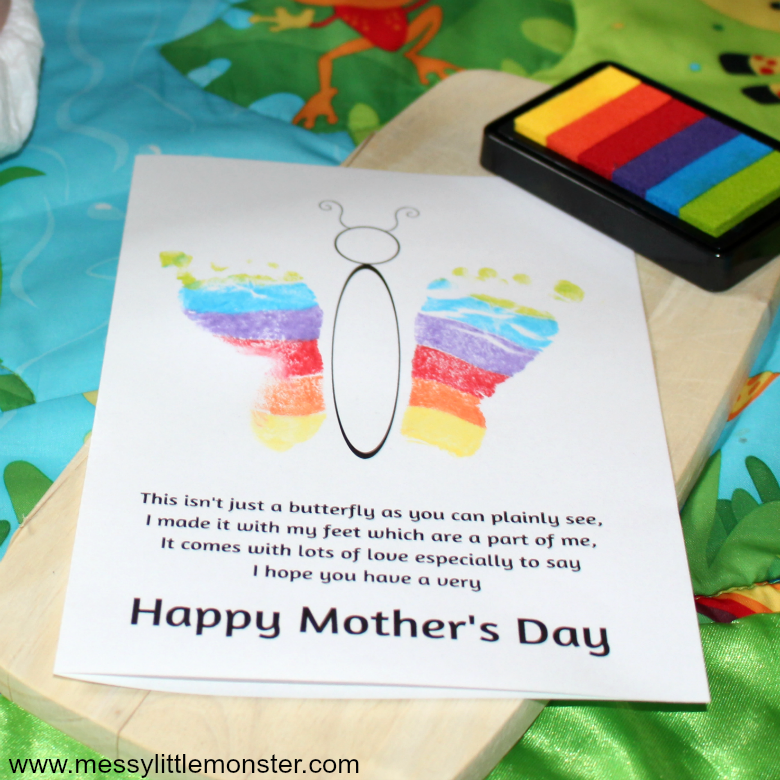 Make Moms day by giving her a beautiful footprint butterfly alongside our printable Mother's Day poem. 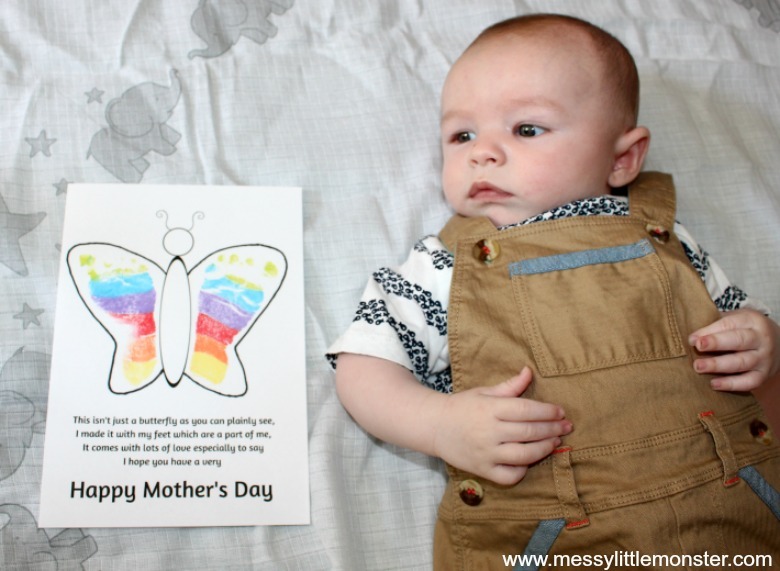 This butterfly Mother's Day card made from baby or toddlers footprints looks adorable and will be treasured for years to come. To make this easy Mother's Day craft simply print out the Mother's Day poem, add footprints and write a personalised message inside your Mother's day card! Mother's Day is a good excuse to show mom how much she means to you. We have a whole collection of Mothers Day crafts as well as a collection of diy gift ideas for mom. Anything involving tiny footprints, handprints or children's drawings are always going to be popular. Footprint butterflies are a perfect craft to make for Spring and Summer. A few years ago we made a beautiful rainbow footprint butterfly from paint that we framed and more recently we made a butterfly shaped clay ring dish. If you are making this craft with a toddler and they want to do more butterfly themed crafts and activities take a look at our bug and butterfly activity calendar. Click the links below to be taken to the product pages! We are a participant in the Amazon Service LLC Associates Program, an affiliate advertising program designed to provide a means for us to earn fees by linking to Amazon and affiliates sites. 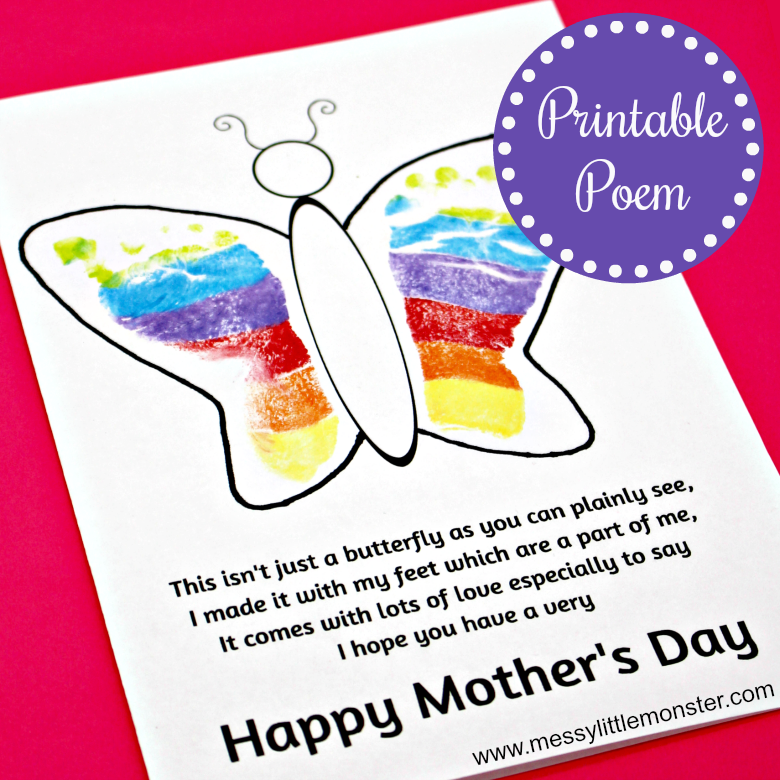 I love the footprint butterfly poem that we have included on this printable Mother's day card. We have also included a special day version so you can give this beautiful card to anybody for any occasion. See this footprint butterfly craft in action! This footprint butterfly card is really easy to make using either a baby or toddlers footprints. You will need the printable Mother's Day card available at the bottom of the page. I would recommend printing this out onto cardstock. 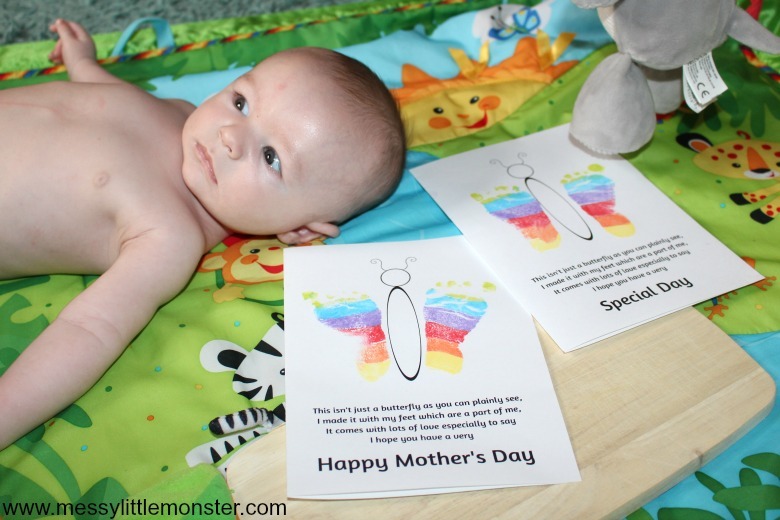 If you are making this Mother's day card with a baby the footprints will fit perfectly on the A6 sized folded card, but if you are going to be making it with a toddler who has larger feet you may need to use the A4 poster sized printable to fit their feet on the page. Before you begin making your footprint butterfly make sure that you have all your supplies ready. You can make your footprints using paint or ink. We went for ink as it is a lot less messy. I love the rainbow ink pad that we used and it was the perfect size for Oliver's (2 months) feet. For older children you could use a jumbo ink pad or of course use paint. Begin by covering your baby or toddlers foot with ink or paint. It is easier to do one foot at a time. When you are happy with the coverage (watch out to make sure that you haven't missed any toes!) press your child's foot onto the card. Press the foot firmly making sure that each toe has been pressed down. You will need to do 2 footprints, one for each side of the footprint butterfly. Make sure that the outer edge of your child's feet go against the middle of the butterfly. 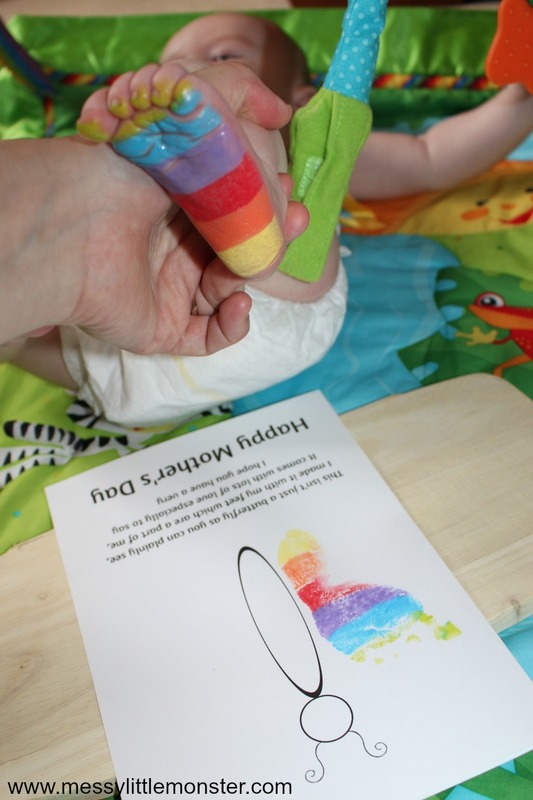 If you are doing this activity with a small baby the easiest way to get a good print is to lie your baby down and then gently press their feet onto the cardstock. You will need to make sure that the cardstock is on a hard surface, we just used an old chopping board. For toddlers you could take their footprints while they sit on the floor or they could stand up and press their feet onto the cardstock. 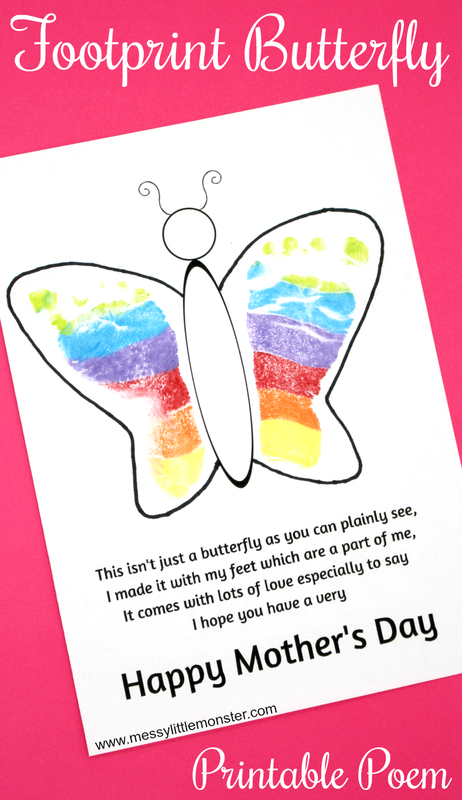 There are two versions of this footprint butterfly printable poem, one says Happy Mother's Day and the other says Special Day. There is a handprint butterfly version too! Once your ink or paint footprints have dried you could add a black outline around the edge of the footprints to make them really stand out. Here is Oliver (aged 2 months) with his artwork. We have included handprint and footprint versions of the butterfly poem as well as having it in 2 different sizes. we have also included the wording special day as well as happy mothers day. There is a small charge of $2 for this set of cards. Alternatively scroll down for just the footprint butterfly template. 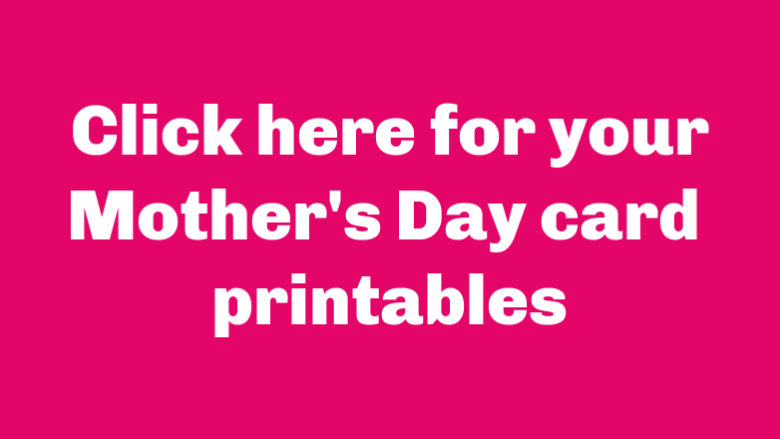 To download this set of Mother's Day printable cards click on the link below. For personal use only. Not for redistribution. All images are copyrighted. Thank you. I heart you card - Add handprints or footprints to the heart. 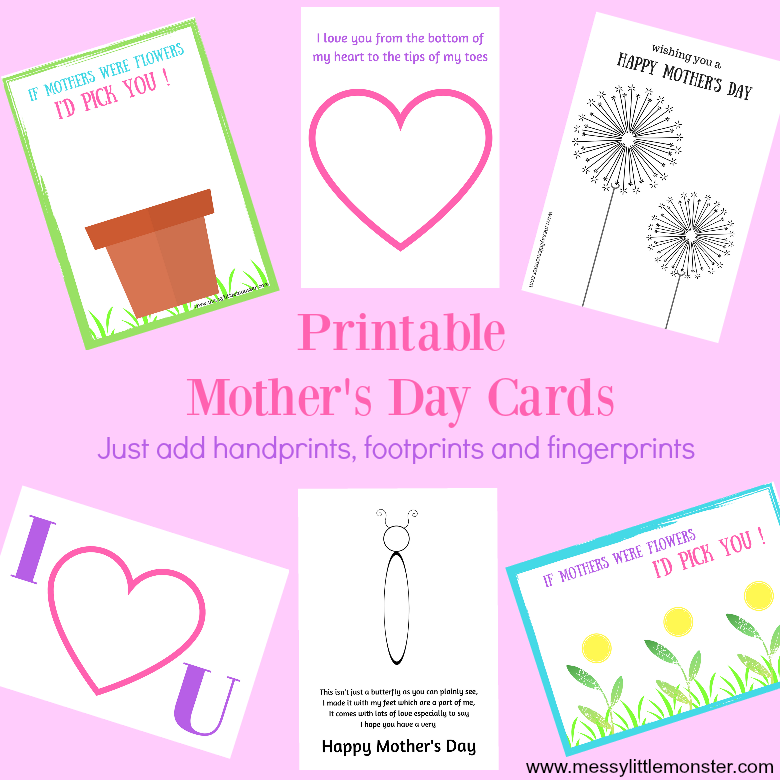 Wishing you a happy Mother's Day dandelion card - Add fingerprints to the dandelion. I love you from the bottom of my heart card - Add handprints or footprints to the heart. These prints were made to stay poem - Add handprints or footprints to the heart. If you would like the A4 version of the footprint poem it is FREE for subscribers to download using the link below. We hope that you enjoy making this easy Mother's Day craft for kids. 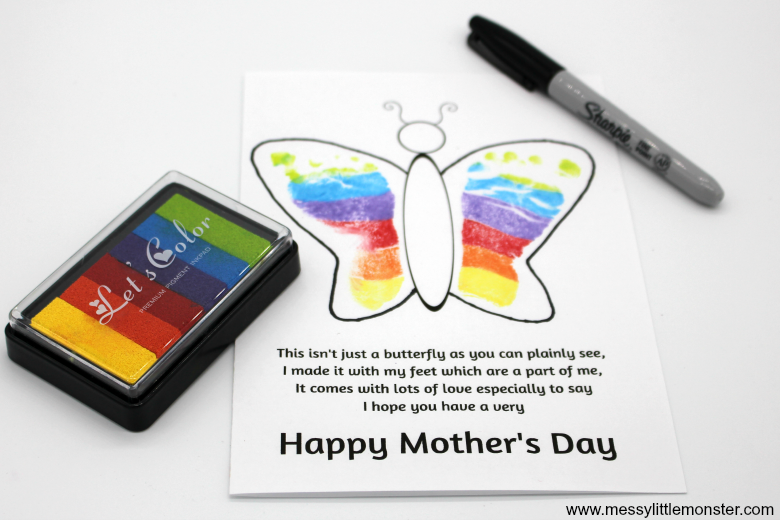 Making a footprint butterfly with this beautiful Mother's Day poem will definitely make a keepsake to treasure. Why not make a Mother's Day gift to go with your homemade Mother's Day card. Follow us on Facebook, Pinterest, Twitter, Instagram, Youtube!